Gardening is a popular pastime for many people. Raising your own fresh produce saves money and is a fun hobby. Each year, there are new products and ideas when it comes to planting a garden. One of the latest trends in gardening is to build raised garden beds. There are many reasons a raised bed is more beneficial than a traditional garden. One reason is that raised beds are easier to care for than a garden that is tilled. A raised bed is not as prone to grass growing in the garden. Raised beds also drain better and provide easier access. They are higher off the ground which makes their maintenance less cumbersome. Their height also puts less stress on your back, because you don’t have to bend over as far to work in them. Additionally, a raised bed will prevent the garden from erosion. Raised beds also prevent vegetable roots from rotting, because water drains easier from this type of garden. This is especially helpful in water logged areas. Additionally, the soil is warmer in a raised bed than in a traditional garden. This helps vegetables get a head start in the spring. 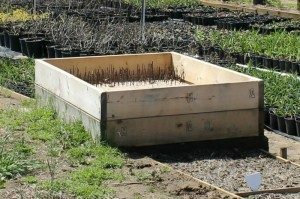 There are many unique ways to build a raised garden bed. First, you need to determine what size you want the garden to be. You may start with one raised bed and then eventually decide to add multiple beds, each with a different type of crop. There are also many different materials that can be used to build a raised bed. The most common way to build a raised garden bed is with wood cedar boards. Wood cedar boards do not rot with age. This type of raised bed is one of the easiest gardens to make and you only need two cedar boards. The cedar boards typically come in 8 foot lengths. This is the perfect size, because you can conveniently cut each plank in half. Some lumber yards will even cut the wood for you at no charge. These two cut planks will make one 4 foot by 4 foot bed. You will also need to buy a 3 foot length of a 1 X 1 inch pine stake. The pine stake can be cut and divided into four pieces. The pine stakes can then be nailed at the corners of the cedar boards. This will form a brace for the corners of the bed and will secure the wood so it stays in place. A second technique to make a raised garden bed is a creative and inexpensive idea. 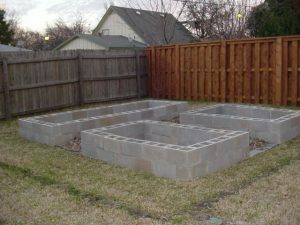 You can use concrete construction blocks to form the perimeter of a raised garden bed. Each block measures approximately 16 inches long and is 8 inches high and you will need 26 concrete blocks. These blocks can be lined up to create a bed that measures 13 feet long by 4 feet wide. A nice benefit of using these types of blocks is that you can use the holes in the sides of the concrete blocks. The holes can be filled with soil. This makes a great place to plant herbs. If you don’t like herbs, you can plant strawberries in them. Another bonus of using concrete blocks is that they gather heat. This helps your plants get a head start with growing. A third way to build a bed is by using wattle, which are straight branch lengths that are cut from trees or shrubs that are woven together as if you were weaving a basket. Select branches that are approximately ½ inches in diameter. Begin to make the raised bed by hammering two foot lengths of rebar in the ground to outline where the bed will be. Space the rebar sixteen inches apart, and leave ten inches of the rebar above the ground. This will form a brace where you will secure the woven wattle around. Once the wattle reaches the top of the rebar, it will need to be further secured. This can be done by bending 2 foot sticks in half and poking each side into the ground on opposite side of the rebar. Repeat this every few feet. Wattle can be lined with burlap to prevent soil from escaping through the cracks in the wattle. In order to build a 4 foot by 8 foot bed, you will need 18 pieces of rebar that measure approximately 24 inches long. You will also need to purchase burlap. Cut the burlap to measure 18 inches wide and 24 feet long. You will also need 100 long flexible sticks. 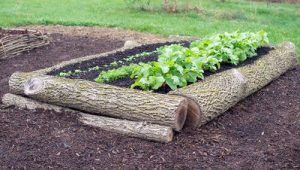 A fourth option for building a raised bed is by using logs. This will give your garden a rustic look. It is also the epitome of “going green.” Choose straight logs that measure approximately one foot in diameter. If you do not have logs that fit this width, you can use smaller ones and stack them. In order to build a 4 X 8 foot bed, you will need two 7 foot logs to line the sides of the bed. You will also need two 4 foot logs to use at both ends. A fifth option is to use sandbags to line a raised bed. By purchasing long, slender bags that are sold as traction sand, you can fashion the outside of the raised bed with the bags. Stack the bags by placing one on top of another. Stacking the bags two high provides enough height for the bed. This is an example of a creative, simple and inexpensive way to create a raised bed. frame is made, place it on top of a well tilled, flat garden area. Place newspapers on the bottom to help deter any weeds from growing up through the ground. Then simply fill the inside of the bed with approximately 6 inches of fresh garden soil. Many gardeners prefer a mixture of two parts soil and one part compost or manure. Whatever combination you decide on, once the soil is added, your garden will be ready for planting. Regardless of what material is used to build a raised garden bed it will be attractive and useful. It will also be easier to maintain than a traditional garden bed. It can help you save money by growing your own produce. Raised garden beds can separate lawn areas and make gardening artistic and bountiful at the same time. Mike McGroarty is the owner of McGroarty Enterprises and the author of several books. You can visit his website at Freeplants.com and read his blog at Mikesbackyardnursery.com.